Fremont, Calif. | September 20, 2011 | Optoma®, the world leader in portable, hand-held projectors, has once again laid down the competitive gauntlet with the all-new PK120. Incorporating Texas Instrument’s new nHD DLP chipset for higher resolution, the 18-lumen, 5-ounce, palm-sized projector packs a bounty of features and improvements, including an all-new file viewer that delivers direct playback of MS Office and PDF files, movies and photos. And with its 2GB of internal memory and microSD card slot, which allows for memory expansion up to 32GB, users will have plenty of storage space for movies, photos, PowerPoint presentations or other work documents. The PK120 is available now from major retailers at a price of $249. 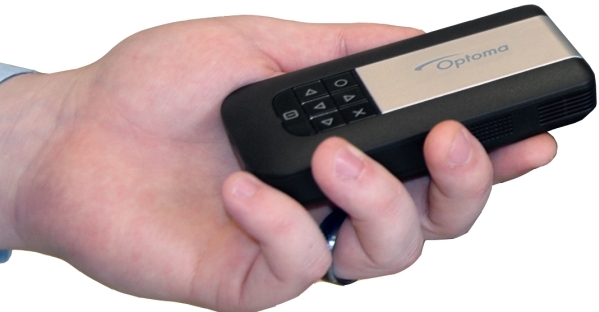 “The technology and feature set included in the PK120 push it right to the head of its class,” said Jon Grodem, Optoma’s senior director of product and marketing. “It’s not only more powerful and versatile, but it’s also easier to use.” The use of TI’s new nHD chipset not only increases the PK120’s native resolution to 640 x 360 pixels, but also introduces a 16:9 widescreen aspect ratio, increasing the amount of information displayed on the image. The new projector also delivers improved clarity of text or other black content by creating a smoother image than seen in other pixels. To improve the PK120’s audio capabilities, Optoma has integrated two 0.5-watt speakers into the projector, plus an audio-out port for connecting to external speakers. A cable adapter is standard with the PK120 for easy connections to PCs and laptops, and other cables are available for connecting to iPods, smartphones, digital cameras, or other devices with video output. "Customers made it clear that the best way to improve on the Pico concept was to add convenience and connectivity options, especially VGA,” said Jon Grodem. “The new improvements make Pico more versatile and more convenient for both personal and business use. 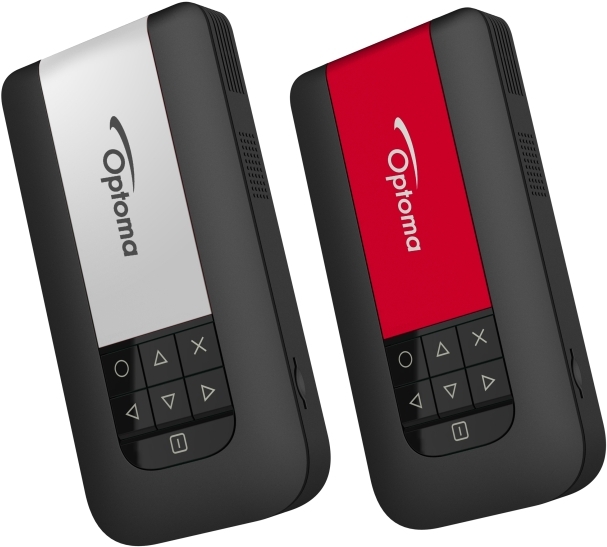 The internal memory can hold thousands of photos or several full-length movies.” According to Grodem, Optoma also developed a new, more intuitive user interface for the PK120 which supports PC-Free viewing of Office documents, and adds navigation features such as zoom and scroll. Another new Pico feature is a dedicated power plug for faster battery recharging. The PK120 plays common picture and video formats along with office documents directly from files stored internally or on microSD cards inserted into the onboard slot. The supported video formats are H.264 (AVI, MOV, MP4, 3GP), MPEG4 (AVI, MOV, 3GP, WMV), M-JPEG (AVI, MOV), Xvid (AVI, WMV). Supported picture formats include JPEG and BMP. The PK120, which measures 4.6” long x 2.4” wide x 0.8” thick, combines Texas Instruments’ latest DLP technology with the most advanced LED technology to produce an image with 2000:1 high contrast ratio and enough brightness for users to project images up to 70” (diagonal). The included, rechargeable, lithium ion battery will power the projector for up to 90 minutes.